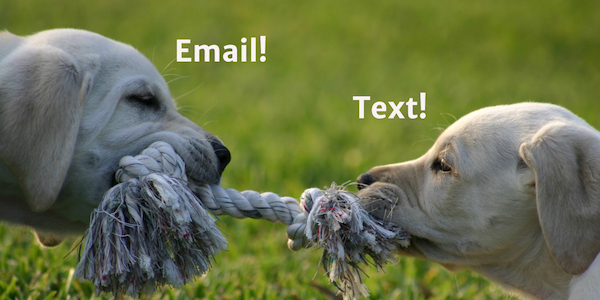 Where do you fall in the email vs. text message divide? If you want to communicate with a work colleague, do you compose an email or send a text? How about a family member? As a rule, do you prefer to text or to email? For most of us, the answer is it depends on the situation. But some people take sides. They insist on texting and never seem to read any emails you send. Or they respond to your texts with lengthy emails. What’s going on here? How do you navigate this divide when you have to work together? The format of a message carries meaning. Unfortunately, that meaning varies from person to person. For me, texting implies urgency – I feel obligated to respond to text messages quickly (but not when I’m driving.) Because of that association with urgency, I hesitate to burden people by sending them texts. If the content isn’t time-sensitive, I’d rather let you handle it on your own schedule. However, some people use text messages to isolate conversations from the clutter of the email inbox. These people use text exchanges for important communications. For others, texting may reflect the strength of your relationship: I’ll email strangers, but I text my family and close friends. Problems arise when these preferences don’t align. When this happens in the work context, people may silently resent each other. Resentment doesn’t fuel productive communications. If you’re befuddled by someone’s text/email patterns, here are a few ideas for bridging the divide. I’m fine communicating by text, as long as you realize that I may not respond right away. I need time to compose my thoughts. I’d like to do this by text because this project is important to me, and I don’t want it to get lost in my inbox. I don’t expect an immediate response to every text. And if you really can’t stand texting, find a happy medium that respects everyone’s preferences. I struggle to type well when texting, so I’ll respond to your texts by email, but I’ll send you a text to alert you to the email. Typing on a phone can be more onerous than using a full keyboard. We rely on abbreviations, emojis, and auto-complete to do the hard work of typing for us. Clarity may suffer. Editing is even trickier. If you’re halfway through a long message and spot a mistake, it’s tempting to let it slide. Most business communications benefit from a moment of consideration. Read before you hit send. Yes, it may be a pain when texting to revise what you have written. But it’s better to invest a minute up front than to send a message that generates confusion or a misunderstanding. Both email and text are poor substitutes for person-to-person conversation. Although I love to write, conversation is often better, particularly when collaborating on a project. If you need to exchange information or collaborate, you can accomplish much more in a 15-minute conversation in person than a stream of texts.